HINCHINBROOK (AUS) (Bay 2007-Stud 2011). 2 wins at 2, AJC Skyline S., Gr.3. Leading Aust. First Season Sire 2014-15. Sire of 320 rnrs, 206 wnrs, 17 SW, inc. Press Statement (BRC JJ Atkins S., Gr.1), Seabrook, Beat the Clock, Whispering Brook, Derryn, Leonardo da Hinchi, Diamond Tathagata, Salsonic, Samara Dancer, Spright, Flippant, Flying Jess, Aliferous, Unite and Conquer, Improvise, Manaya, The Virginian, SP Problem Solver, etc. PRESS STATEMENT (c by Hinchinbrook) 6 wins. See below. PRESSDAY (c by Domesday) 5 wins-4 at 2-from 1000m to 1600m, US$27,480, A$852,400, BRC TJ Smith Classic, Gr.1, MRC Sandown Guineas, Gr.2, BRC Sires' Produce S., Gr.2, Champagne Classic, Gr.2, AJC Preferred Seating 2YO H., 3d AJC Skyline S., Gr.3, Santa Anita Joe Hernandez H., L. Sire. Will Impress (g by Beautiful Crown (USA)) 7 wins from 1400m to 1800m, A$98,445, 2d BRC Facebook.com H., Kirks H.
Emperor Albert (g by Magic Albert) 3 wins to 1500m in Aust. 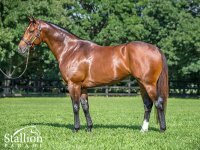 Press Review (f by Street Cry (Ire)) 2 wins at 1300m, 1400m in 2017-18 in Aust. Antonio Padre (c by Hinchinbrook) Placed at 2 in 2018-19, 3d ATC Justify at Coolmore 2YO H.
Press Box (f by Hinchinbrook) Placed at 2 & 3 to 2018-19, 2d ATC TAB H., Tab.com.au 2YO H., 3d ATC Friday Night Racing H.
Pressure. Winner at 2100m in 2018-19, 3d VRC Kennedy Oaks Trial P., MRC Clanbrooke Racing H.
Kaaptive Empress. 9 wins. See above. Nikmat. 2 wins at 1400m, 1600m, MVRC Sunicrust Bakeries H., 2d SAJC Carrington Champagne H., 3d VATC Nicopolis H., SAJC Dr Pepper Mile H.
Goin and Growin. 2 wins at 1½m, 2m, Haydock Hawthorn H.
DINNER DATE (f Mossman) Winner at 2, A$80,307, MRC Merson Cooper S., L, 3d VRC Ottawa S., L, SAJC Alan Sheppard H., MRC Hyland Race Colours H.
VAQUERA (f High Chaparral) 3 wins from 1400m to 1900m, A$213,630, Newcastle JC Tibbie S., Gr.3, ATC Australian Turf Club H., 2d ATC Darley P., 3d BRC Queensland Oaks, Gr.1, ATC Craven P., Gr.3, BRC Doomben Roses, Gr.3, ATC Might & Power H., 4th ATC City Tattersalls Club Cup, L. Producer. MARENOSTRO (g Duelled) 10 wins from 1400m to 1600m, A$506,650, ATC Winter Challenge H., L, FIIG H., Neville Begg H., Forum Group H., McGrath Estate Agents H., All Too Hard at Vinery H., TAB Rewards H., 2d Hawkesbury RC Rowley Mile H., L, ATC Global Independent QC H., McGrath Estate Agents H., 3d ATC Doncaster Prelude, Gr.3, Premier's Cup Prelude H., Cellarbrations H., Dooleys H., Ranvet H., 4th ATC Winter S., L.
Promise Keeper (g Success Express) 8 wins from 1200m to 1600m, NZ$37,525, S$502,555, Singapore TC Open H., Hawkes Bay Enterprise Motor Group Ltd H., Waikato RC Loch Haven Thoroughbreds H., Avondale JC Laurie Eccles H., Singapore TC Class 2 H., Class 2 H., Benchmark 97 H., 2d Singapore TC EW Barker Trophy, L, Kranji Mile, L, Glenmorgan Sprint Trophy, Taranaki RC New Zealand Bloodstock H., Waikato RC JR Ryan H., Singapore TC Merlion Trophy H., Marsiling H., Benchmark 97 H.-twice, 3d Singapore TC Star Prince Challenge, L, Class 1 H.-3 times, ARC Korean Air H., BOP RC Zest 2000 Ltd H.
Grandissima (f Savabeel) 2 wins at 1950m, 2000m, 2d CJC Warstep S., L. Producer. Race Record: 11 Starts 6-2-1 A$1,832,275. HINCHINBROOK 2 wins at 2, A$590,300, AJC Skyline S., Gr.3, Canonbury S., L, 2d ATC All Aged S., Gr.1, 3d AJC Sires' Produce S., Gr.1, MVRC William Reid S., Gr.1, MRC Oakleigh P., Gr.1, STC Pago Pago S., Gr.2, Heritage S., L, City Tatt's RC Governor Macquarie Cup, L, 4th STC Golden Slipper S., Gr.1. He entered stud in Aust. in 2011. Leading Aust. First Season Sire in 2014-15. 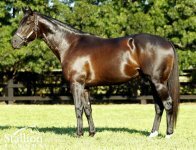 Sire of 320 progeny to race, 206 winners (64.0%), earnings of over $30 million, 17 stakes winners, 16 stakes placegetters, inc.
PRESS STATEMENT (12c, Kaaptive Edition, Upper Nile). 6 wins-3 at 2-from 1100m to 1600m, A$1,832,275, BRC JJ Atkins S., Gr.1, MRC Caulfield Guineas, Gr.1, ATC Hobartville S., Gr.2, Stan Fox S., Gr.2, TAB Place Multi 2YO P., TAB Place Multi H., 2d ATC Randwick Guineas, Gr.1, Run to the Rose H., Gr.2, 3d ATC George Ryder S., Gr.1. BEAT THE CLOCK (13g, Lion Hunter, Crested Wave). 7 wins at 1200m, 1400m to 2018-19, HK$25,852,775, HKJC Centenary Sprint Cup, Gr.1, Sprint Cup, Gr.2, University Alumni H., BOC Credit Card H., Coloane H., Yin Kong H., Canmake Tokyo H., 2d HKJC Centenary Sprint Cup, Gr.1, Queen's Silver Jubilee Cup, Gr.1-twice, Sprint Cup, Gr.2, Chinese Club Challenge Cup, Gr.3, Chevalier Property H., Jim and Tonic H., Wu King H., 3d HKJC Longines Hong Kong Sprint, Gr.1, Chairman's Sprint Prize, Gr.1, BOCHK Wealth Management Jockey Club Sprint, Gr.2, Sha Tin Mile Trophy H., Sunset Peak H.
SEABROOK (15f, Don Eduardo, Rory's Jester). 2 wins at 2 in 2017-18, A$741,800, ATC Champagne S., Gr.1, Sweet Embrace S., Gr.2, 2d ATC Phar Lap S., Gr.2, MRC Sandown Guineas, Gr.2, 3d MRC Thousand Guineas, Gr.1, Blue Diamond Prelude (f), Gr.2, HDF McNeil S., Gr.3, 4th MVRC Inglis Banner 2YO S., L.
WHISPERING BROOK (13f, Machiavellian, Ogygian). 10 wins-5 at 2-to 1400m to 2018-19, A$1,183,150, WATC Karrakatta P., Gr.2, MVRC Australia S., Gr.2, VRC Standish H., Gr.3, WATC Sires' Produce S., Gr.3, Gimcrack S., Gr.3, MVRC Abell S., L, WATC Supremacy S., L, VRC School Holiday Program H., SAJC John C Harris 70th Birthday H., WATC Initial 2YO P., 2d MVRC Atlantic Jewel S., L, 3d MRC Thousand Guineas, Gr.1, WATC Asian Beau S., Gr.3, Birthday S., L, 4th SAJC Manihi Classic, L.
DERRYN (13c, Lonhro, Unbridled's Song). 3 wins-1 at 2-at 1000m, 1200m, A$788,675, ATC Arrowfield 3YO Sprint S., Gr.2, Darby Munro S., L, MRC Brian Reckas 2YO H., 2d ATC Up & Coming S., Gr.3, 3d BRC Doomben Ten Thousand S., Gr.1, MRC Blue Sapphire S., Gr.3, Zeditave S., Gr.3, 4th MRC Manfred S., Gr.3. LEONARDO DA HINCHI (15c, Octagonal, Bletchingly). 3 wins-2 at 2-from 1100m to 1600m to 2018-19, A$225,250, MVRC Bill Stutt S., Gr.2, MRC Ladbrokes Back Yourself 2YO H., 2d VRC Antler Luggage P., L, 3d MVRC Mitchell McKenzie S., L.
SALSONIC (13g, Grand Lodge, Zoffany). 2 wins at 1300m, 1600m, A$371,450, BRC Queensland Guineas, Gr.2, 2d ATC Hyland Race Colours 2YO H., Tab.com.au P., 3d ATC Liverpool City Cup, Gr.3, Spring S., Gr.3, Hawkesbury Guineas, Gr.3. SAMARA DANCER (13f, Singspiel, Top Ville). 2 wins at 2, A$185,000, MRC Blue Diamond Prelude (f), Gr.2, SAJC Dalziel Racing 2YO P., 2d SAJC MAC Drink Driving Grow Up H., 3d VRC Danehill S., Gr.2. DIAMOND TATHAGATA (14c, Tale of the Cat, Lord Seymour). Winner at 2, A$271,225, ATC Skyline S., Gr.2, 2d ATC Inglis Nursery, RL. FLIPPANT (12f, General Nediym, Nashwan). 6 wins-3 at 2-to 1400m to 2017-18, A$655,360, VRC Frances Tressady S., Gr.3, MSS Security Sprint H., L, BRC Lancaster S., L, Scone RC Woodlands S., L, Wyong Magic Millions S., 2d VRC Standish H., Gr.3, MRC Geoffrey Bellmaine S., Gr.3, ATC McGrath Estate Agents H., 3d ATC Guy Walter S., Gr.2, Breeders Classic, Gr.2, Clarence River JC Ramornie H., L, 4th GCTC Magic Millions Guineas, RL. SPRIGHT (13f, Dash for Cash, Brocco). 5 wins at 1100m, 1200m to 2017-18, A$883,575, VRC Crown Resorts P., Gr.3, ATC Star Kingdom H., Gr.3, Qld Tatt's RC WJ Healy S., Gr.3, City Tatt's RC Brian Crowley S., L, ATC Chifley Financial Services P., 2d MVRC William Reid S., Gr.1, ATC Wenona Girl H., Gr.3, Wellington Boot 2YO P., 3d MVRC AJ Moir S., Gr.1, ATC Light Fingers S., Gr.2, Percy Sykes S., Gr.3, Scone RC Inglis 3YO Guineas, RL, ATC Lonhro P., L, Peter Svendsen 2YO H., 4th MVRC Manikato S., Gr.1, ATC Arrowfield 3YO Sprint S., Gr.2. FLYING JESS (13f, Magic Albert, Full and By). 2 wins-1 at 2-at 1400m, A$1,421,680, SAJC Sires' Produce S, Gr.3, GCTC Magic Millions Guineas, RL, 2d MVRC WH Stocks S., Gr.2, MRC Ladies Day Vase, Gr.3, WW Cockram S., Gr.3, 3d MVRC Sunline S., Gr.2, 4th MRC Twilight Glow S., L, SAJC CS Hayes Memorial Cup, L.
ALIFEROUS (15f, Woodman, Pleasant Tap). 3 wins-1 at 2-from 1200m to 2000m to 2018-19, A$228,780, ATC Adrian Knox S., Gr.3, 3d ATC Owners Recognition Raceday 2YO H., 4th ATC Australian Oaks, Gr.1. UNITE AND CONQUER (16c, Magnus, Danzero). 2 wins at 2 in 2018-19, A$191,750, Wyong Magic Millions 2YO Classic, RL, VRC Maribyrnong Trial S., L.
MANAYA (13f, Zephyr Zip, Kaoru Star). 5 wins-1 at 2-to 1350m to 2018-19, A$286,600, Scone RC Woodlands S., L, BRC Rod Kemp H., Weareco H., Qld Tatt's RC Matt Stav & Abby P., GCTC Ubet Auditorium P., 2d BRC Hotel Beach House H., Become a Member H., 3d GCTC Moco Seafood H., Qld Tatt's RC Hutchinson Builders H., Weddings H., 4th GCTC Goldmarket H., L.
THE VIRGINIAN (12g, Forestry, Carson City). 3 wins to 1200m, A$259,150, BRC Chief de Beers H., L, 2d ATC Show County H., Gr.3, 3d BRC Stradbroke H., Gr.1, 4th BRC Moreton Cup, Gr.2. IMPROVISE (14f, O'Reilly, Desert Sun). 2 wins at 1300m, 1600m in 2017-18, A$137,165, SCTC Princess S., L, ATC Owners H., 2d ATC Floratine Glycofuze H., 3d BRC Gold Coast Bracelet, L, ATC Casino Prince at Vinery P.
Brazen (12g, Belong to Me, Bluebird). 7 wins from 1300m to 1800m to 2018-19, A$254,610, ATC Theraces H., Dubbo TC Gold Cup, SCTC Butler McDermott Lawyers H., 3d BRC Rough Habit P., Gr.3, Port Macquarie Cup. Brooklyn (12g, Beautiful Crown, Bahamian Bounty). 6 wins to 1100m to 2018-19, A$170,780, 2d SAJC Medallion Homes H., 3d MRC Chairman's S., Gr.3, SAJC Mittys P., Oakbank RC Coca Cola H.
Super Too (13f, Tale of the Cat, Sea Salute). 5 wins-1 at 2-at 950m, 1000m to 2017-18, A$347,775, ATC Primo H., MVRC Ladbrokes 55 Second Challenge H., 2d MRC Caulfield Sprint H., Gr.2, VRC Crown Resorts P., Gr.3, 3d ATC Challenge S., Gr.2, MVRC Ladbrokes 55 Second Challenge Final H., ATC Schweppes H., 4th VRC Cap d'Antibes S., L.
Un de Sceaux (12g, Cape Cross, Star Way). 3 wins to 1400m, A$111,050, VRC Hugo Throssell VC H., 3d MRC Sandown S., Gr.3, MVRC Simpson Construction H.
Wild Heart - Hinchinlove (H.K.) (14g, Forestry, Valdez). 2 wins-1 at 2-at 1200m to 2017-18, A$150,925, HK$1,179,300, Wyong Magic Millions S., ATC TAB Rewards 2YO H., 2d MRC Zeditave S., Gr.3, HKJC Lord Kanaloa H., 3d ATC Fresh for Kids H., HKJC Verbena H., Po Yan H.
Problem Solver (14f, Justice Prevails, Tarrago). 2 wins at 1200m to 2018-19, A$304,910, Wyong Magic Millions S., GCTC Magic Millions P., 2d ATC PJ Bell S., Gr.3, Your Local Greengrocer H., Australian Turf Club H., 3d ATC Snitzel H.
Knowable (13g, Octagonal, Marauding). 2 wins at 1100m, 1400m, A$131,225, VRC ATA Celebrates 50 Years H., 2d VRC Diabetes Research H., 3d MRC Autumn S., Gr.2, VRC Straight Six H., L, MRC Mypunter.com H.
Old Trieste (12g, Choisir, Rubiton). 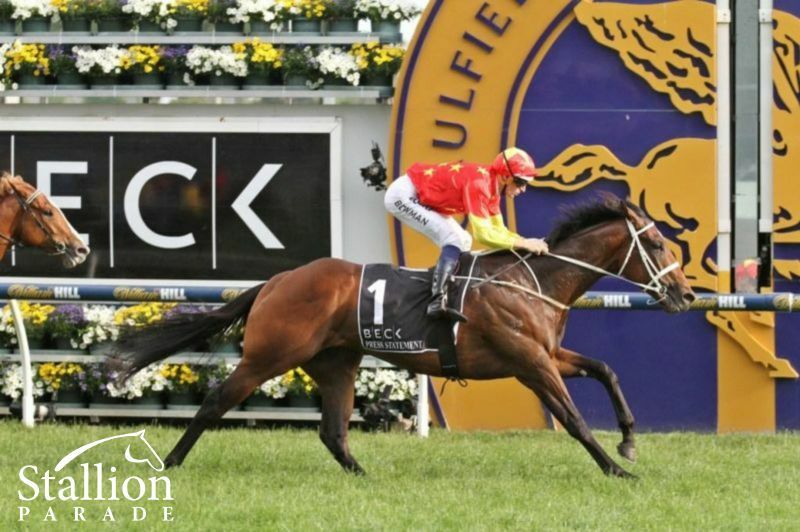 2 wins at 1000m, 1600m to 2018-19, A$121,635, 2d VRC Maribyrnong P., Gr.3, BRC James Boag's Premium H., 3d VRC Eugene Gorman 2YO H., MRC Grand Hotel Frankston P., 4th GCTC BJ McLachlan S., Gr.3. Rhi's Rocket (12g, Irgun, Raise a Native). 5 wins to 1200m to 2017-18, A$157,500, WATC Amelia Park P., Tabtouch Masters H., Perth Cup January H., 2d WATC Fine Wine Wholesalers H., Crown Towers H., 3d Pinjarra RC Magic Millions WA 3YO Trophy, RL, WATC Free Wi-Fi Available P., Prive Fashion Platform H.
Brooklyn Storm (12g, Seattle Slew, Northjet). 5 wins to 1200m to 2017-18, A$197,295, BRC Stanton P., Epicure Memorable Events H., Toowoomba TC Wimmers Premium Soft Drinks H., 2d BRC Superior Food Service P., Ipswich TC Iron Jack Beer H., 3d Ipswich TC Keith Noud H., L, ATC Schweppes H., BRC National Jockeys Trust H., 4th BRC Lough Neagh S., L.
Bluebrook (14g, Falbrav, Quiet American). 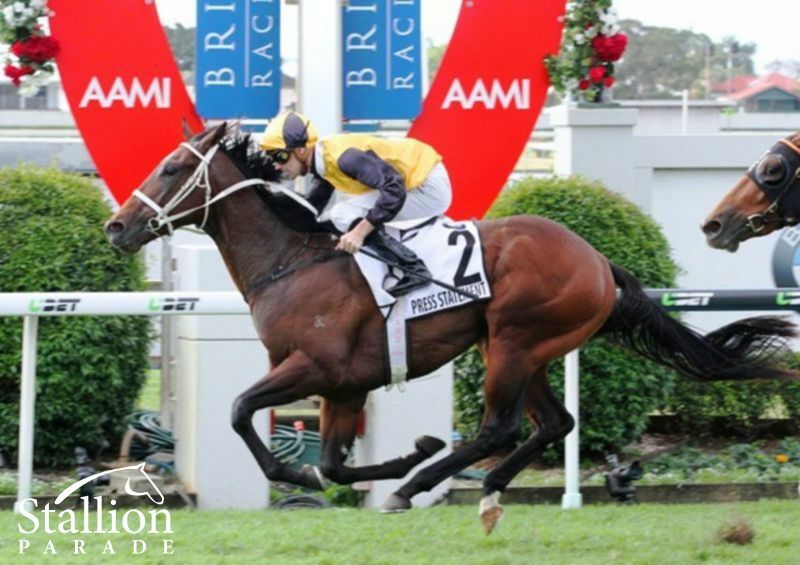 4 wins from 1100m to 1600m to 2018-19, A$217,540, BRC Memberships H., SCTC Istyle TV H., Cooper Small Construction P., 2d Ipswich TC Ray White H., 3d BRC Bernborough H., L, TAB H., Epicure Memorable Moments H.
Pennstock (14g, Hennessy, Kaoru Star). 3 wins from 1400m to 1600m in 2017-18, TTC Tassie Instant Marquees H., Launceston Cup Raceday H., Longford Cup New Years Day P., 3d TRC Hobart Guineas, L, Tasmanian Derby, L, TTC Sires' Produce 2YO P., Go Racing Tasmania P.
Brulee (13f, Lonhro, Seattle Dancer). 2 wins-1 at 2-at 1000m, A$89,260, 2d Qld Tatt's RC Wintergarden S., L, ATC Piper-Heidsieck 2YO H., 3d Scone RC Turangga Farm H., 4th VRC Lexus Hybrid P., L.
His sire sons include Press Statement, etc. Undefeated Group 1 winning 2yo – 3 starts, 3 wins including BTC J.J. Atkins Stakes. Winner of the time honoured Caulfield Guineas Gr.1 as a Spring 3yo, won by successful stallions such as Lonhro, Redoute’s Choice, Luskin Star, Vain, etc. The only colt of his year to win a Group 1 race as a 2yo and 3yo. 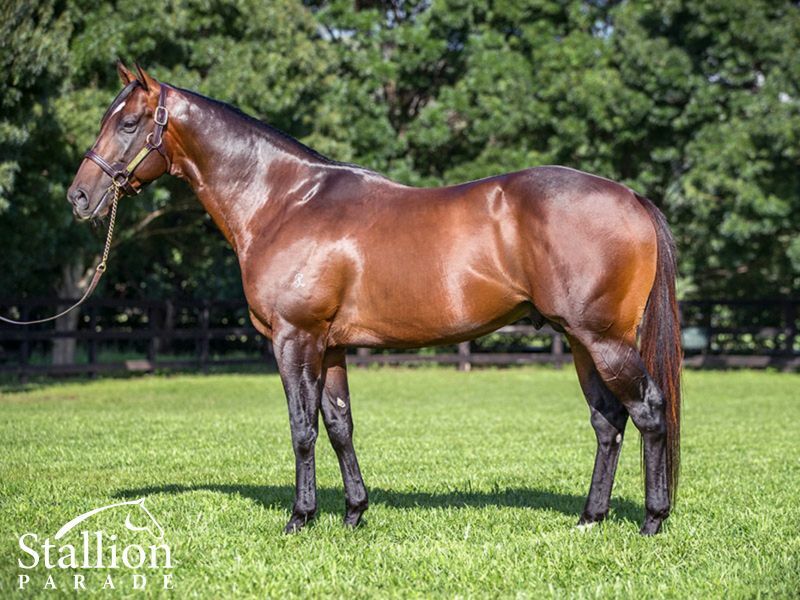 From a family that is quickly establishing itself as a major force in the Australasian Thoroughbred industry, PRESS STATEMENT is the first son of Champion First Season Sire HINCHINBROOK to stand at stud.